It is always hard to know how works at an art fair are actually going to play out in real life. Some dealers don’t like to send JPEGs in advance, and that’s their right—though too bad for those of us who mainly work online. Others send images of works that (of course) look much different in person. Here’s a few pics that caught my attention in advance of Art Toronto’s opening. Weppler and Mahovsky always surprise me with their sculptures on the themes of consumerism and throwaway detritus. One time they cast a shopping cart in aluminum foil, which was great. 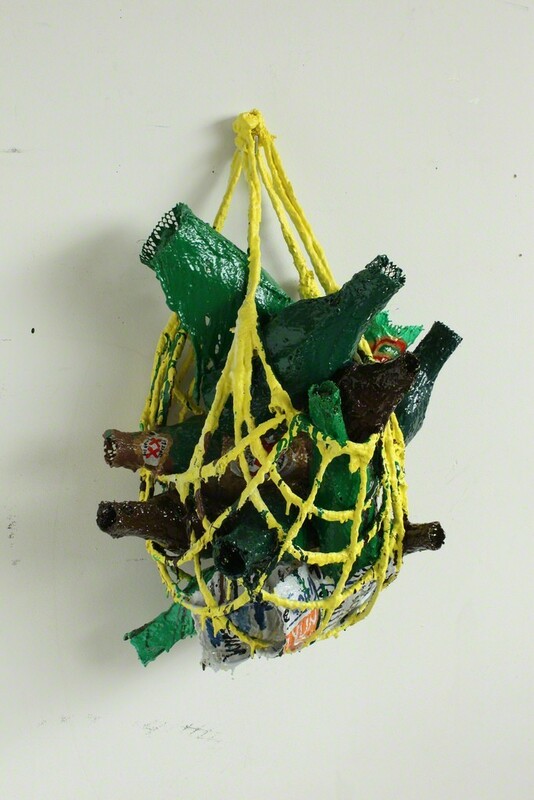 I am looking forward to seeing their new sculptures of beer bottles in bags at the fair. I have admired this Montreal duo’s massive paper installations for some time. (One is now on view at Toronto’s YYZ Artists’ Outlet —go see it!) At the fair, I’ll content myself with this smaller work—I have no idea what it says, but as usual I enjoy Chloe Lum and Yannick Desranleau’s exuberance and over-the-top styling. 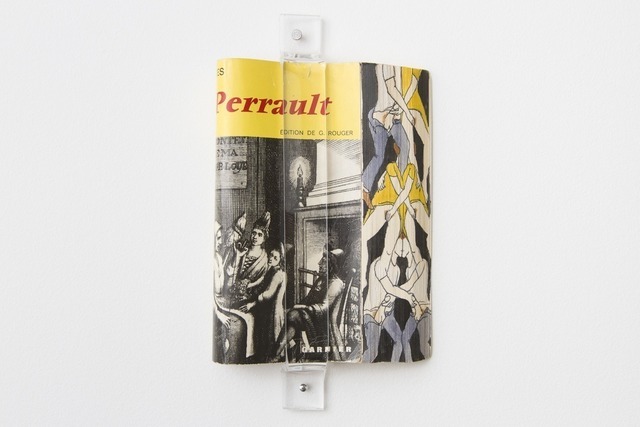 It looks like Wil Aballe is bringing a lot of interesting work to the fair, including anamorphic drawings on the ends of books by 2010 VIVA Award winner Marina Roy. Uncanny and inventive. Jaime Angelopoulous is becoming increasingly well known for her sculptures, but I still like her drawings too. Like her other works, they reflect a sense of (for me) lightness and play. 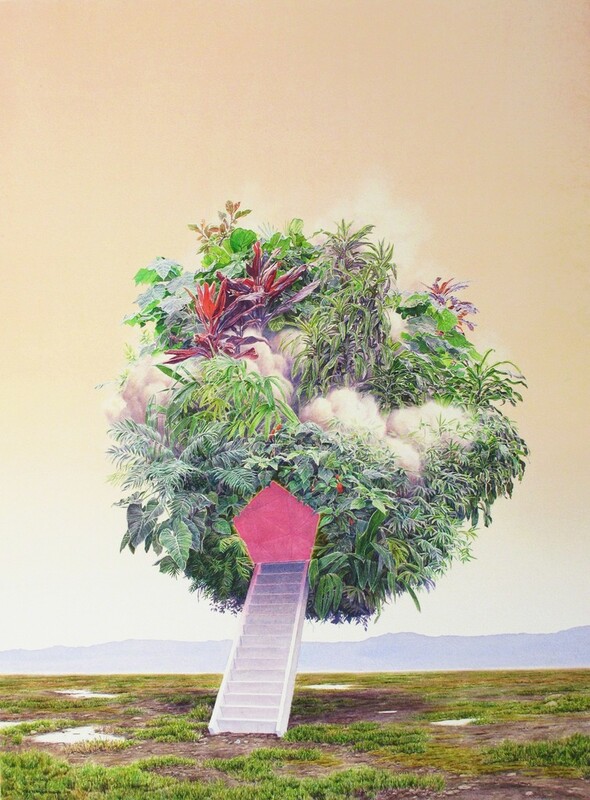 Lansdowne’s surreal watercolours and pencil drawings always take me to another place. Now, he has used the same aesthetic to portray a vehicle that actually could take me to another place. Thanks Tristram! You know how when you become familiar with the work of an artist, every work of theirs that you see becomes connected in your mind to another one that you love and enjoy? So it is when I see almost any work by Kent Monkman. This photo is but a fragment of his wider Miss Chief Eagle Testickle performances and portrayals, but it reminds me of the potent mix of humour and critique throughout his practice. I’ll also be checking Pierre-Francois Ouellette’s booth to see what new Monkman work he might be bringing. 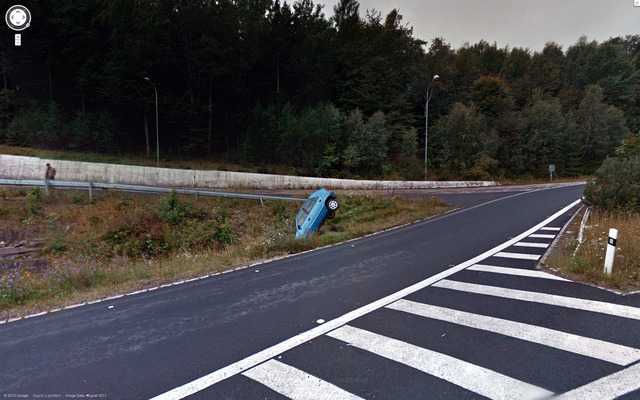 Yet another one of the “did that really happen?” shots that Rafman has dug up on Google Streetview in his virtual worldwide quest to sieve some of the strange and the beautiful from our mundane, everyday-life (erm) global surveillance device. I enjoy the way that Moran’s abstract paintings are lush and thoughtful at the same time. Snack-industry icon and 1974 Vancouver mayoral candidate Mr. Peanut gets the Marat treatment. Love the absurdity here, as in all the Mr. Peanut works. Check out Trasov’s website for more. Sometimes I’m a sucker for anything that looks like a screenprint. I definitely want to check out Greeley’s clean Newfoundland vistas at the fair. For daily coverage of Art Toronto during the fair itself (October 24 to 28) visit canadianart.ca/arttoronto. Explore Art Toronto on Artsy.